If you want to completely change your morning routine for the better, the Dash Rapid Egg Cooker is definitely the way to do it. This simple device makes it ridiculously easy to cook perfect eggs every single time in a number of different preparations. Just drop in the eggs, press one button, and walk away. 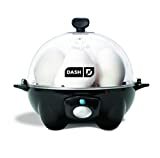 Dash’s egg cooker will cook them to perfection and then keep them warm for you until you’re ready to eat. It’s a bargain at $20, but Amazon is selling it right now for only $16.19. Trust us, you’re going to love it.